No matter what your business brings to the table, if your brand positioning is weak or non-existent, then you’re just wasting your time. Distinguishing your brand from the competition calls for a level of strategy and finesse that you can only achieve with the right branding firm at your back. Picking the right branding agency, however, comes with its own set of challenges. With so many options to choose from, you’ll need to ask the right questions to find the right fit. Branding agencies offer specialized services that help to create, develop, improve, and maintain your brand identity. Agencies will identify your goals and objectives and work to develop an intimate understanding of your business. This information is used to create a plan that strategically positions your business and helps spread brand awareness. In addition to helping a business establish their brand, many agencies also offer advertising services. The primary goal of a branding agency is to help a business identify its “brand message” and communicate that message through various advertising and marketing campaigns. A great reputation can be hard to build, but the expert team at MARION makes it easy. Give our branding agency in Houston a try today. It’s natural to feel overwhelmed when you first begin your search for a branding company. There are literally thousands of agencies to choose from, so it’s essential that you have a method in place to find the best option for your organization. 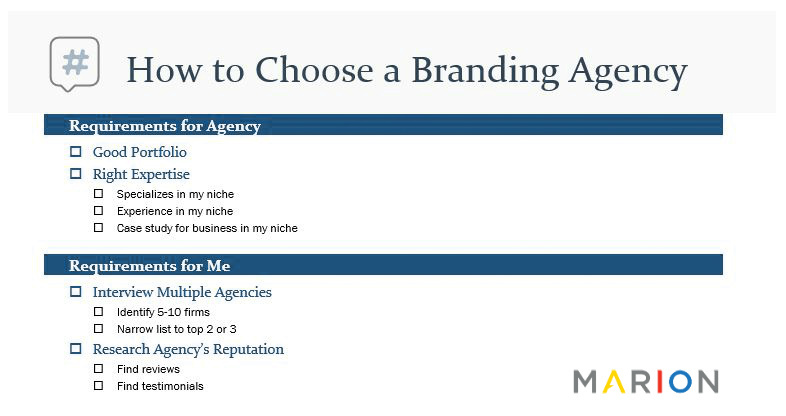 Right expertise – Ensure the branding agency you decide to work with specializes (or has experience) in your niche. This will make it easier for the agency to craft an effective brand development strategy. Good portfolio – What kind of results has the agency achieved for past clients? A good track record means they know what they’re doing. Interview multiple agencies – Don’t just go with the first agency you encounter. Identity at least five to ten firms you feel are a great fit for your business. Then narrow that list down to two or three choices so you can move forward to the interview phase. Research the agency’s industry reputation – Every agency leaves a digital footprint whether they like it or not. One of the easiest ways to identify an agency’s reputation is through testimonials. The experiences of past clients will provide a firsthand account of what an agency can bring to the table for your business. Once you’ve made your final decisions, you’ll still need to find an agency that’s just right for your business. To help you make an informed decision here are five questions to ask the branding agencies you’ve narrowed your list down to. 1. What Results Have You Gotten for Past Clients? A branding firm shouldn’t have to hide their results from you. If you’re going to pay them good money to build and spread your brand message, then you have a right to see what they can deliver for your business. Whether these results come in the form of reports, analytics, or case studies, it’s important you can measurably see how they’ve helped past clients. A consistent track record of satisfied clientele should give you some peace of mind. 2. What Kind of ROI Can I Expect? Before you spend money with an agency, do you know how to set marketing goals? Your return on investment will be determined by the goals and objectives you set for your marketing strategy. Thus, this question can’t be answered until you have a fully fleshed out plan in place, complete with marketing KPIs and metrics to help you track your progress. Asking about ROI should prompt a conversation about the future of your brand and various creative ways to create brand awareness. 3. Can You Walk Me Through Your Strategic Process? The earning potential of branding companies is wholly dependent on their level of creativity. What is their creative process? How will this creativity be used to boost your brand? Is there anything unique about the way they perform market research? A good branding agency will be able to walk you through their strategic process. If what you hear resonates, then that’s a good sign they may be the right firm for you. 4. Can You Execute a Brand Identity Campaign? If the answer to this question is no, then you’re talking to the wrong agency. You don’t want to work with an agency that simply establishes your brand and lets go of the wheel. You need an agency that can execute a fully fleshed out campaign from A to Z. You should want a single firm handling all of your branding such as MARION’s Austin branding agency. Having one agency establish your brand and another to execute the strategy will cause delays and possibly lead to less than desirable results. 5. Why Are You Interested in Working with My Brand? When you ask this question, take note of the language used from each agency. Do they have a firm grasp of your industry? Do they speak industry jargon? Do they truly understand what your brand brings to the table? If their answer is too generic, you may want to move on to the next agency. Learning how to choose a branding agency takes time and patience. The time you put into your search will ensure you’re matched with a firm that’s perfect for your organization. Rush the process, and you may end up with a brand that doesn’t quite suit your company. If you’re on the hunt for an agency that can help you establish and promote your brand, contact MARION today. We offer a range of services including web design, digital marketing, graphic design and much more. Meet with the strategists at our marketing firm to see if our agency is the right fit for your business.